Try to imagine building interactive web-based tools as easily as using Access. Flex 2 is a development environment for creating Flash applications with a powerful user interface comparable to a desktop client: the territory that Ajax is carving out so effectively, in other words. 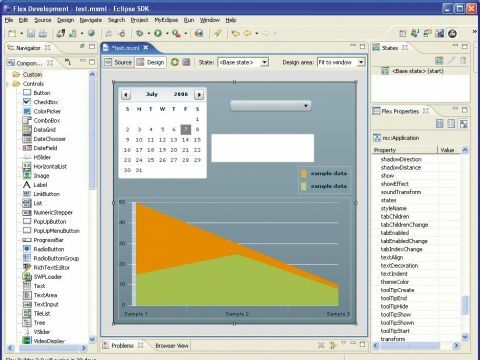 Based on Eclipse, Flex Builder 2 is an IDE for developing such tools, an essential part of the Flex system. Core components are supplied in the Flex 2 framework and SDK. The Flex 2 framework provides a library of over 100 components and containers, from simple buttons to advanced controls such as data grids or rich-text editors. You can use these components to create application interfaces and sub-class them to modify behaviour, or you can create your own components from scratch using the component API. Flex applications are written using MXML, an XML-based language that provides a declarative approach to controlling an application's visual appearance. Using MXML, you can position components; specify constraints to enable a more dynamic user interface; and use View States and Transitions to control how the application should respond to different user actions and events. To customise the look and feel of an application, you can set built-in style properties through Cascading Style Sheets or attach custom visual assets. Flex applications access data and services through a set of built-in service components. They can access XML data through HTTP and web services, as well as the Flex Data Services 2 server-side component. Available separately, this J2EE application enables the use of remote Java objects and publish-andsubscribe messaging, and provides a rich data-binding infrastructure that enables applications to remain responsive, even when waiting for server-side requests to complete. At its heart, Flex Data Services 2 offers a robust infrastructure for moving data between the client and server and can handle real-time data and very large data sets. This can significantly reduce the amount of time spent writing, debugging, and maintaining code. This can be significant when designing accessibility into your application. You should also consider this path for any deployed Ajax application where aspects are to be upgraded. The Flex Builder 2 IDE forms an integral part of this ecosystem, offering content-assist coding tools for both ActionScript and MXML. The advanced debugging enables you to test Flash applications as well as server code. To enhance Flex 2's appeal to the business market, Adobe has also released Flex Builder 2 with Charting (£575). The charts package is fully integrated into the framework's general infrastructure for effects, styles, data binding and drag and drop, and will work seamlessly with Flex Data Services. FDS2 is available in three flavours: a free Express edition for single users, a £4,100 licence for 100 users, or a gulp-inducing £13,000 licence for enterprise. We expect the take-up of FDS2 to be purely in the enterprise market - for example, SAP is using Flex within its NetWeaver Visual Composer to create rich interfaces for SAP solutions. Importantly, the Flex 2 SDK, which is used to compile MXML into your Flash 9 application, is free as part of the Flex 2 framework. If you are not using the FDS2 server-side component - and we suspect most developers won't - this is all you need to deploy a Flex application.